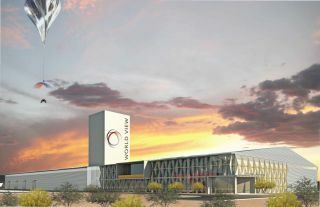 An artist's depiction of Spaceport Tucson, which will host balloon launches for space tourists riding on World View flights. World View Enterprises, which aims to loft paying customers to the stratosphere beneath a giant balloon, will do so from the newly approved Spaceport Tucson in southeastern Arizona, company representatives announced Tuesday. Pima County's Board of Supervisors voted 4-1 Tuesday (Jan. 19) in favor of setting up Spaceport Tucson, which the county will own but World View will operate. World View will also construct its new headquarters next to the spaceport, and will serve as anchor tenant of the new County Aerospace, Defense and Technology Business and Research Park. "What's really exciting about it for us is that it colocates our engineering, development, tests, balloon and payload manufacturing all right next to the launch pad, so we're really able to do all of our primary functions in one place incredibly efficiently," World View chief technology officer Taber MacCallum told Space.com. "So it really brings down our development costs and our operating costs." World View is developing a balloon-based system that will take passengers up to an altitude of 100,000 feet (30,000 meters) or so in a pressurized capsule, allowing them to see the curvature of the Earth and the blackness of space. The ride will be gentle and relatively lengthy, lasting 5 to 6 hours from liftoff to touchdown. Tickets aboard the six-passenger capsule (which also accommodates two crewmemembers) are currently selling for $75,000 apiece, and the first commercial crewed flights are scheduled to take place in 2017. World View has already launched a 10-percent-scale version of its capsule to the stratosphere, and the company is planning to do a full-scale (but still uncrewed) test flight in a few months, CEO Jane Poynter said. The company has also flown scientific payloads on commercial, uncrewed balloon flights — another branch of its business. Artist's illustration of World View's balloon-borne passenger capsule in the stratosphere. "We're already routinely flying," Poynter told Space.com. World View has been based in Tucson since the company was founded in 2013. New Mexico and Florida made pitches to get the company to move, but the new spaceport and headquarters deal helped convince World View to stay put. "It is a business choice," Poynter said. "But I will say, personally, I was very happy that the state and county were able to put together a really competitive and compelling offer for us." Arizona now joins a number of other states with private spaceports in the works or already up and running, including Virginia, New Mexico, Texas and Oklahoma. "I think this commercial spaceflight industry that we have been watching grow slowly has hit an inflection point, and you are going to see it just grow rapidly," Poynter said. Spaceport Tucson will likely cater primarily to balloons and unmanned aerial vehicles, MacCallum said. The facility will not be certified for rocket launches initially, and it's unclear if rockets will be part of its future, he added.